I just tucked Karen into bed about 10 minutes ago, and I'm sitting here with the dogs; trying to quiet my mind and get my body to shut down for the evening. I've got some calming music playing on Pandora, and am debating whether or not to go pop a xanax; although I am holding the few that I have left in reserve for when I absolutely need them. I could have definitely used one earlier tonight. Today is the 1st Tuesday of the month, which means that tonight was the monthly Boone Trails District, Round Table meeting. I've been on staff for the Cub Scout RT Staff for almost two full years now. I feel that it gives me a greater opportunity to share, and give back to scouting, from what I have learned in my training over these past 6+ years. Every time the first Tuesday rolls around, I think to myself that I would rather be doing something else with my evening, but as soon as I'm there, I have a good time. I have to admit that it is something that I really enjoy (most of the time). Everything seemed normal when I left the house. Although my stomach has been a little upset all day. I drove to the meeting, and walked in just like usual. Signed in on the roster, and started to settle in at the staff table. We engaged in some usual chit chat, and I started talking with Becky and Carrie about the upcoming weekend out at Klondike. The only thing I can guess is that I had some sort of full blown anxiety attack right then and there in front of the entire team. It was like a wave of sheer terror had washed over me, and my vision went blurry for a brief moment. 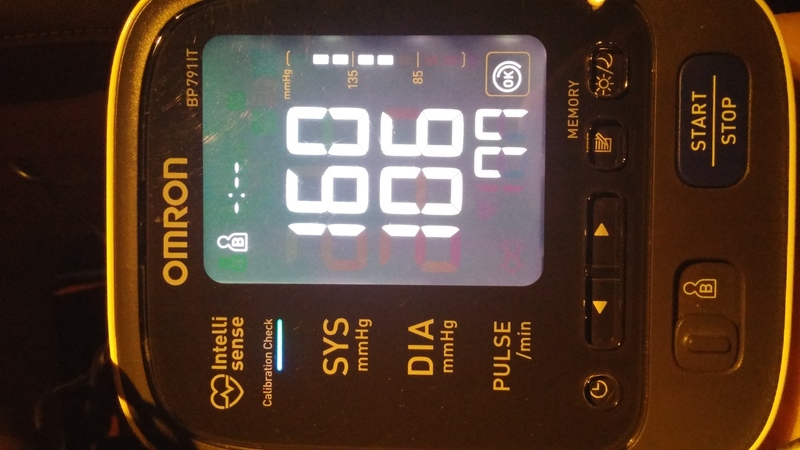 My heart beat was pounding in my ears, and the slight headache that I had started to get as I was leaving the house (Karen even gave me 4 ibuprofen to take on my way out, offering to let me wash it down with her "ice cold diet Pepsi.") intensified x10 times over in an instant. It went from dull ache to migraine level pain in a matter of about 60 seconds. I could hear my heartbeat in my own ears, and my skin felt like it was about to burst from the inside out like a squeezed water balloon. I told the ladies that I was feeling dizzy, and needed to go outside for a drink of water and some air. The look on my face must have been a horrific fright, because they both asked if they could help me go sit down somewhere, and wanted to know where I was parked if I were headed to my car. They kept asking me to sit down, because they were worried I was about to pass out. I went into the bathroom there at the Cottleville Knights of Columbus hall, and spashed a bunch of cold water into my face. then I took a long slow drink of water from the water fountain. It wasn't getting any better, and the longer I tried to stay on my feet, the worse it seemed to be getting. I told them (which now included several more ladies from the group of people I normally interact with) that I needed to go out to my car and take a pain pill. I really did intend to take at least one or two baby aspirin (to help with the headache), but I just needed to sit somewhere quiet. As I sat in the ACADIA, I took a few sips of the soda I had grabbed on the way out the door from home, and took two baby aspirin. 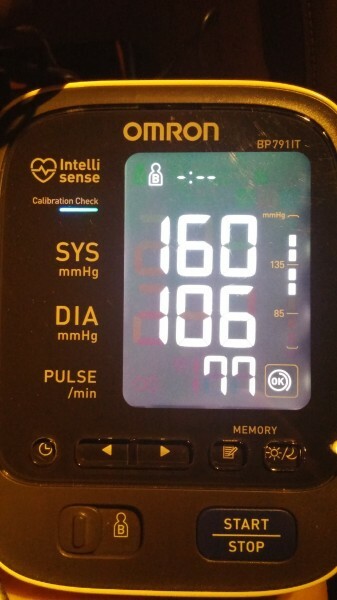 My blood pressure machine was sitting on the front seat of the car. I've been taking it to work with me, because I need to start tracking my numbers again. Even though I managed to get my daily numbers down to around 120/78 back in February and march, I feel like they have been creeping up a bit since I put 15 pounds back on over the past coupe of months. I got the BP machine out of the case, and let it go through its pace of taking three measurements to average out. I was not prepared for the results that came over the screen; and at first I thought it must be a mistake. So, I made the machine do the whole routing again. the results were only just slightly better than the first. I felt like I was about to have a stroke or heart attack right there in my car. If not, I felt like I was going to die from embarrassment, from having had an anxiety attack in front of the whole round table staff. I was certain that word was spreading at that very moment. I knew that opening announcements were probably still going on, and I wanted to try to slip back in (although the door is at the front of the presentation area) before it was time to present our program for the evening. After about 15 minutes, I made my way back in, got another drink of water, splashed my face again, and wobbled into the room. I survived this attack, but I'm scared to death to think when and where the next one might hit me.